Love fills the air this time of year! Here at Forever Flowering, we have a gorgeous array of real-touch, arrangements and bouquets suitable for everyone and every taste! Valentine’s Day is the day to show your love, committment or gratitude to those you love. Whether it’s a gift for your spouse, significant other, secret admirer, best friend or even for Mum, Forever Flowering has you covered. Our arrangements and bouquets are so much more than a week long centrepiece. Our artificial arrangements stand proud and look perfect 365 days of the year. With solid glass vases and crystal clear, life-like artificial water, it’s no wonder why people keep coming back to us for gift after gift. We’re perfect for every special occasion! The year, check out our new range of hand tied bouquets! Without knowing, people presume these bouquets are full of real flowers! 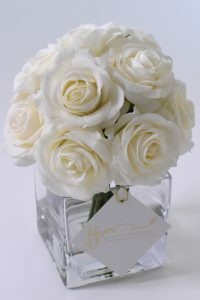 You can keep them as is forever, or pop them into your favourate vase! Either way, they’re guaranteed never to have petals that wilt! Check out our full Valentine’s Day suggestions here! Are you in a new relationship? For those who weren’t planning on spending Valentines Day with someone they’ve got feelings for, without assuming too much – try multi-colored arrangements with roses, tulips, orchids and other accessories. Leaving it to the last minite this year? Before you order for guaranteed Valentines Day delivery – please email or call us on 0458 108 109 to check for stock availability and delivery information. For more artificial flower news, tips, and tricks, please subscribe to our newsletter for the latest blogs.